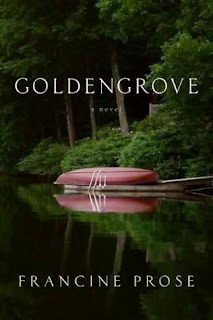 Goldengrove is the thirteenth novel by Francine Prose . Thirteen-year old Nico and her beautiful, talented, enigmatic and older teenage sister Margaret are incredibly close. Living with their free-spirited, Bohemian parents, they share inside jokes and hang out together constantly. One day, when Nico and Margaret are spending a lazy summer afternoon boating in a nearby lake, Margaret dies unexpectedly from a heart failure while swimming underwater. Suddenly, Nico and her parents' worlds are horribly shaken and each decides to find their own refuge in the face of mourning -- Nico's father turns to seeking a local gateway to Heaven, Nico's mother turns to drugs, and Nico herself surrenders herself to the aisles of her father's bookstore named Goldengrove and to Margaret's boyfriend Aaron. To help each other recover from Margaret's death, Nico and Aaron decide to immerse themselves in Margaret's world by watching her favorite movies, eating her favorite ice cream, and even wearing her old clothing. In a subtle coming-of-age way, Nico learns how to manage grief and her impending sexuality. The most enjoyable aspect of Goldengrove is the originality of Nico and her family, perhaps due to their restless Bohemian antics. Each character exudes class in their own way, including Margaret's brooding boyfriend Aaron. While the synopsis of the novel suggests an abundance of sexual undertones, I still expected a higher level of taboo from this novel and in the end, I was disappointed. The buildup to Margaret's accident, as well as the buildup to how Nico eventually decides to deal with her mourning is exciting, but I regret to say the intrigue of the novel dies out shortly after Nico and Aaron begin spending time together. Francine Prose 's latest novels are My New American Life (April 2011) and Touch (2009). Have you read any novels by Francine Prose -- if so, which is your favorite so far?